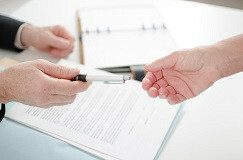 Employers and employees alike often wonder whether their non-compete agreements are enforceable. Non-compete agreements are an increasingly common part of the modern workplace, so it’s only natural that questions about their validity are becoming more frequent and more important. Faced with a better job offer with another company, an employee has to pause to consider whether the non-compete she may have signed years earlier is valid, and whether the benefits of the new job are worth the risk of getting sued by her current employer. Likewise, an employer faced with a departing employee needs to verify whether the employee signed a non-compete and whether the threats posed by that employee’s decision to work for a competitor are large enough to justify incurring the costs and uncertainties of trying to enforce it. There are multiple, complex factors that affect the enforceability of a non-compete agreement. Four factors are generally the most important, however. Perhaps the most critical factor to consider is where the non-compete would need to be enforced. A few states—California being the most prominent—expressly prohibit nearly all forms of non-compete agreements. These states regard non-competes as unlawful restraints on employee mobility and the freedom of employers to hire the best and brightest talent. Other states—Texas and Georgia, for example--take a skeptical view of non-competes, but nonetheless will enforce them if certain conditions are met. Still other states—Washington and Massachusetts, for example—take a more flexible approach to non-competes, generally allowing employers to benefit from them as long as the post-employment restraints are not unreasonably severe and do not unduly limit competition. Given that many employees in today’s high-technology and knowledge-based industries often seek out the most attractive opportunities available, without regard to state lines, thorny questions of enforceability and choice of governing law are becoming more common—particularly when an employee moves from a state that generally permits reasonable non-competes (like Washington) to a state that categorically prohibits them (such as California). Even in states that permit employers to enforce some non-competes, the scope of the post-employment restrictions will be scrutinized. If the restrictions are written very broadly—such as by forbidding an employee to work for any other company in the same industry, or foreclosing the employee from accepting a similar position within a very large territory—a court will be less likely to find the non-compete reasonable, and thus less likely to enforce it. In some states, if the scope of the non-compete is found to be too broad, the court will strike it down and refuse to give it any effect at all. This rule encourages employers to craft narrowly tailored non-competes because they know that any overreach in drafting is likely to result in total invalidation when they seek to enforce it. Other states, such as Washington, allow the court to “blue pencil” the agreement—that is, to narrow an overly broad non-compete to a more reasonable scope. What is “reasonable” is often highly fact-dependent and can vary widely by industry. Some industries or professions are, by their nature, more local in scope—real estate or insurance sales, for example. Other professions and industries may more properly be regarded as having a national scope, such as aerospace engineering or pharmaceutical research and development. The length of time of the post-employment restraint is another key factor in whether it can be enforced. Not surprisingly, longer durations are more difficult to enforce than shorter ones. While there is no widely agreed limit on the permissible term of a non-compete, one-year restraints are commonly found to be reasonable in many industries. Two-year restraints are routinely enforced in industries with fairly stable product and customer life-cycles. But generally speaking, restrictions of more than two years may become increasingly difficult to justify, particularly in rapidly changing industries such as the high-technology, medical, or e-commerce sectors. Some states have well-defined statutory limits (or presumptive limits) on the maximum permissible duration of a non-compete, and thus leave courts little room to develop common-law rules of thumb. Again, as employment relationships now routinely cross state lines, determining which state law controls the validity of a non-compete can become increasingly complex. A final factor in determining whether a non-compete is valid and enforceable is whether the employee received consideration in exchange for the post-employment restriction. This factor can become a significant problem for employers when the non-compete was not signed before (or very shortly after) the employee began her employment. Washington is one of several states that regard continuing at-will employment as insufficient consideration to support imposition of a non-compete. Thus, if the non-compete was presented to the employee for signature a substantial time after she began work, the non-compete may not be enforceable unless the employee received some additional benefits for executing it—such as a bonus, extra vacation, stock options, or a salary increase. Less tangible forms of consideration—such as additional and specialized job training—are also sometimes characterized as sufficient to support a non-compete. But where such training was provided merely to enable the employee to better perform the job she was hired to do, without additional compensation, it could be regarded as insufficient consideration because, arguably, the benefit of the training flowed entirely to the employer not the employee. In such circumstances, a court might view the consideration as illusory and thereby determine that the non-compete is invalid. Although other factors (such as “public policy,” or whether the employee’s termination was involuntary) can occasionally come into play, careful analysis of the above four factors will often determine whether a non-compete is enforceable. In some instances, a single factor may be outcome-determinative; in other instances, the court may have to examine each factor, weigh them against each other, and decide whether, on balance, the non-compete is reasonable. Moreover, the employee’s possession of competitively sensitive trade secrets may give rise to additional grounds to prevent her working for a competitor, even in the absence of an enforceable non-compete. Because of the fact-specific nature of this analysis, and especially given the wide variations among states’ laws, both employers and employees should consult with experienced counsel to assess whether their non-competes are likely to be enforced when challenged.